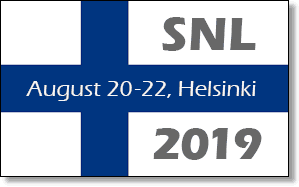 Apply for an SNL 2019 Travel Award Today! The Society for the Neurobiology of Language (SNL) will award between 20 and 25 Travel Awards to help cover travel and registration costs for the Eleventh Annual Meeting. Through the travel awards, SNL aims to encourage and foster the participation of junior scientists who are members of underrepresented groups as defined by the National Institutes of Health. Eligibility: All students and postdocs are eligible to apply. You must be a current SNL member. Priority will be given to individuals who fall into one of the underrepresented groups as defined by the National Institutes of Health. This includes 1. Individuals from racial and ethnic groups that have been shown by the National Science Foundation to be underrepresented in health-related sciences. 2. Individuals with disabilities, who are defined as those with a physical or mental impairment that substantially limits one or more major life activities, as described in the Americans with Disabilities Act of 1990, as amended. Note that women are not considered an underrepresented minority for this particular award. Application Process: To apply, please submit the following materials: your CV, a brief personal statement that outlines why you deserve the award, and a statement as to whether or not you fall into one of the underrepresented groups as defined by the National Institutes of Health. Applications should be sent to awards@neurolang.org, no later than May 20, 2019.